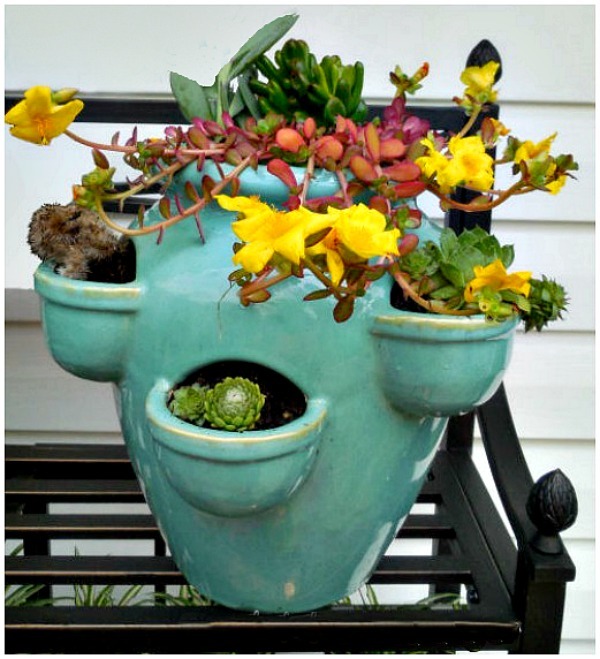 Succulent planters - 25 Fun Looks that Show you can Plant Succulents in Anything! 25 Succulent Planters – You Can Grow these Hardy Plants in Just About Anything! Succulents are so versatile and easy to care for. They are very drought tolerant, perfect if you have a “brown thumb” and look great planted in so many ways. These 25 fun succulent planters will show you that if it can hold dirt, it can be planted with a succulent! Planters can be very expensive to buy retail. But with succulents, why bother? A quick check around your house will reveal lots of different ideas for planting these hardy plants. Let’s Round up Some Fun Succulent Planters! 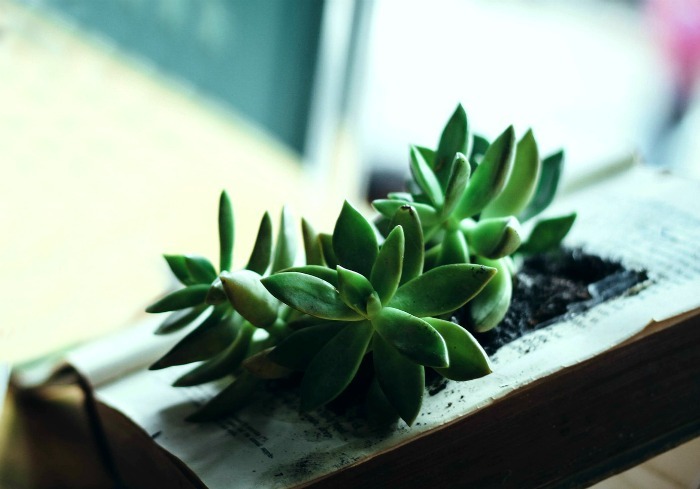 Succulents are super easy to propagate so you may find yourself with so many of them that you are looking for interesting items to plant them in. One of the best places to find some interesting succulent planters is in the kitchen. Check out these ideas! This pretty succulent display started out as an old wooden drawer with compartments. The project is easy to make and only cost me about $3! 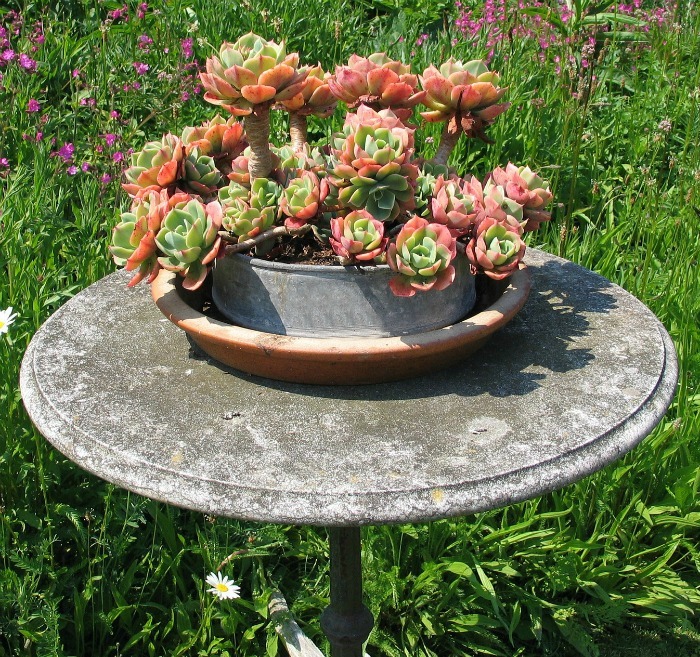 This charming metal fruit basket is lined with sphagnum moss and then planted with a variety of succulents. To water it just place it in the sink, water and allow the extra moisture to drip away. So pretty! If you have a spring form pan, you have a rustic succulent planter! The spring form pan is placed in a terracotta saucer and filled with soil and then planted with this pretty crassula plant. Sit it on a plant stand in the garden for a great look. Dutch ovens are not just used for making a one pot meal! This ceramic dutch oven has seen the last of its kitchen days. 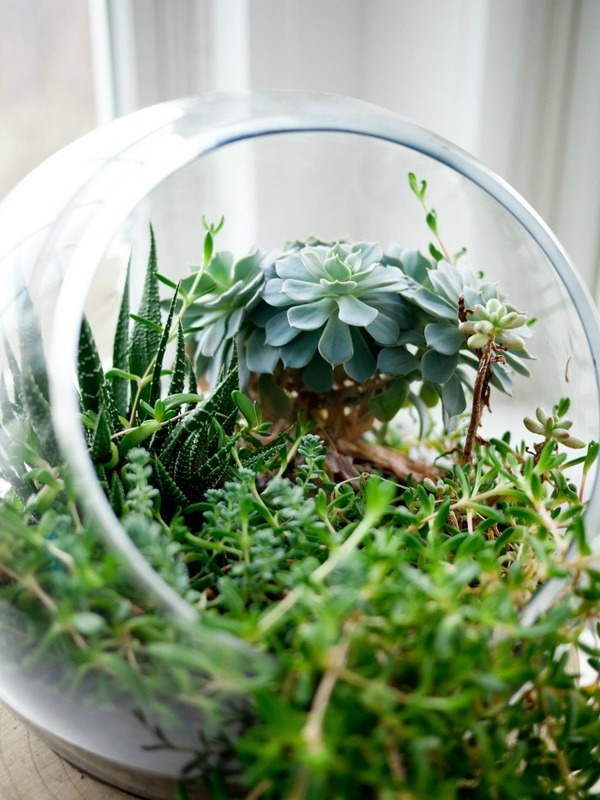 It had been re-purposed into a home for sempervivum – hens and chicks. 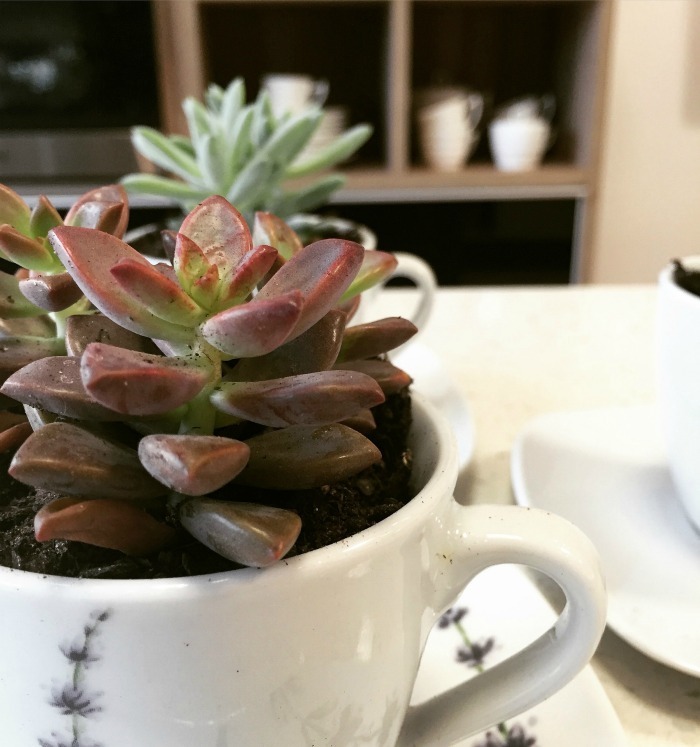 Any coffee or tea cup is a perfect succulent planter for a small sized individual plant like this crassula. Just be sure to add some rocks in the bottom for drainage. Anyone for a cup of crassula? I had so much fun making this succulent terrarium from my old Mr. Coffee pot carafe. 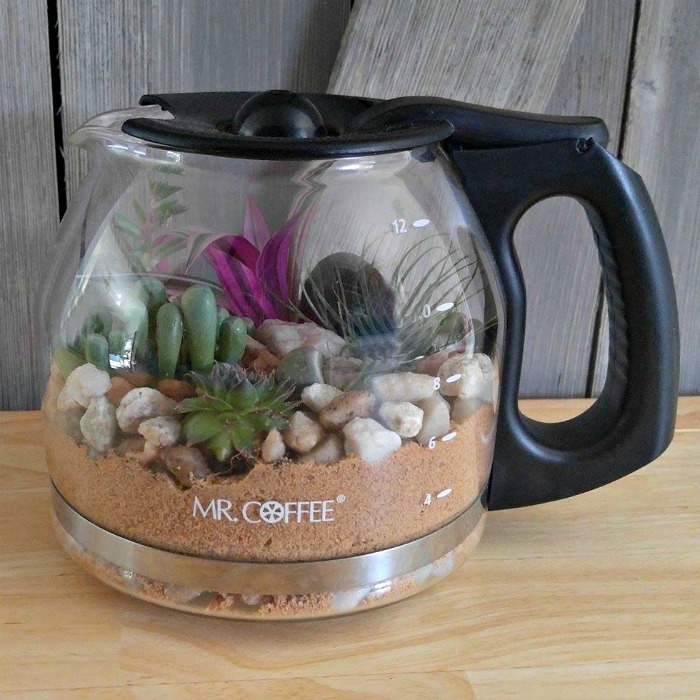 See the coffee pot terrarium project here. 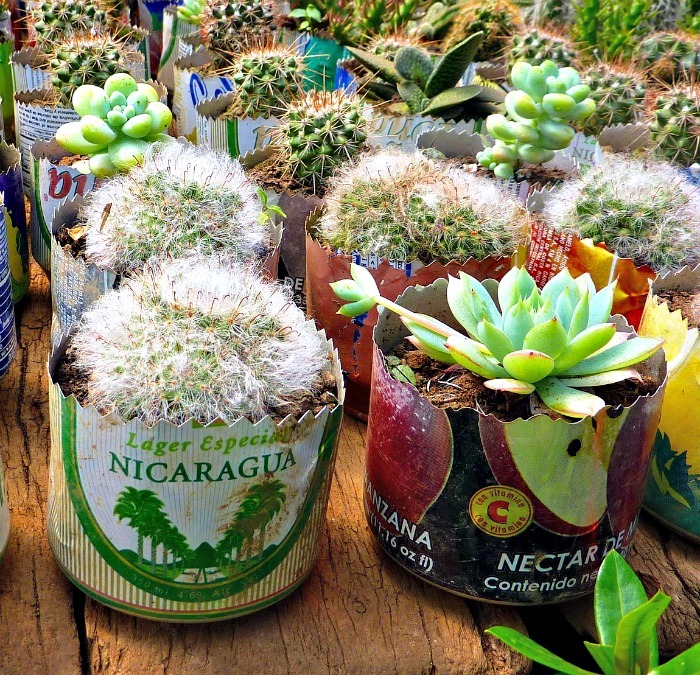 Colorful old tin cans make a unique succulent planter. Just be sure to add rocks for drainage. Use shears to cut a fancy edge to the top and plant with either cacti or succulents for a fun kitchen look. There is no need to paint or cover the outside. 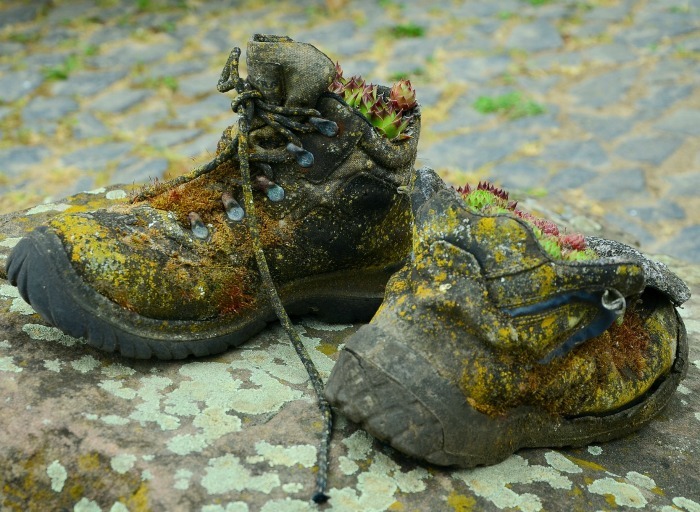 The fun rustic look is just right for succulents. 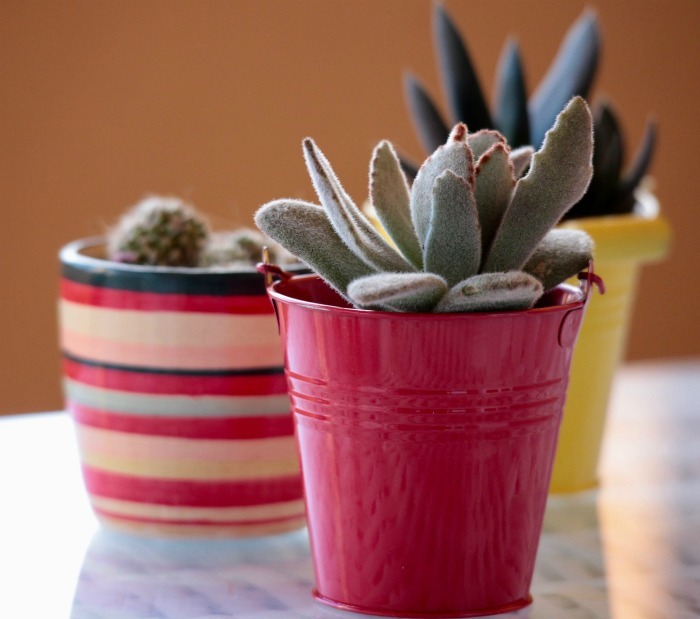 There are hundreds of retail products that are great for planting succulents. 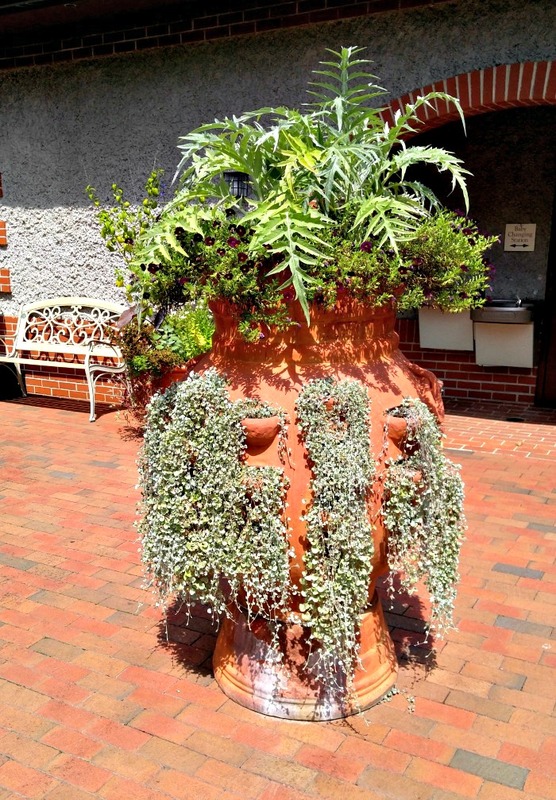 Terracotta or hand fired clay pots are often used since they compliment the look of succulents. Here are some of my favorites. 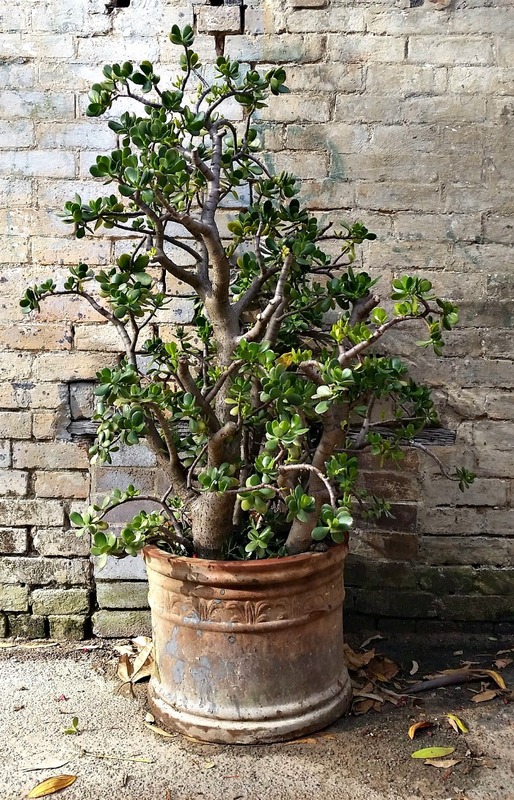 Jade plant or Crassulata Ovata – is also called a money plant. It can take the shape of a tree easily. This large terracotta tub has a distressed look that pairs perfectly with the aged look of the plant. 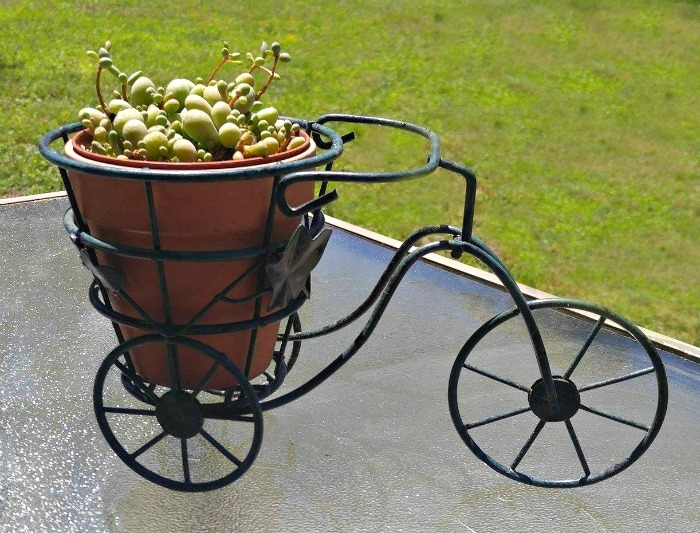 This adorable tricycle planter was a teacher’s gift to me when I taught preschool. I used it inside my home with silk flowers for years and then realized what a great outdoor succulent planter it would make for my string of beans plant – Senecio herreanus. Cacti and succulents, by nature, have a minimalist look to them. They go beautifully with round cement planters to keep that look when you display them. 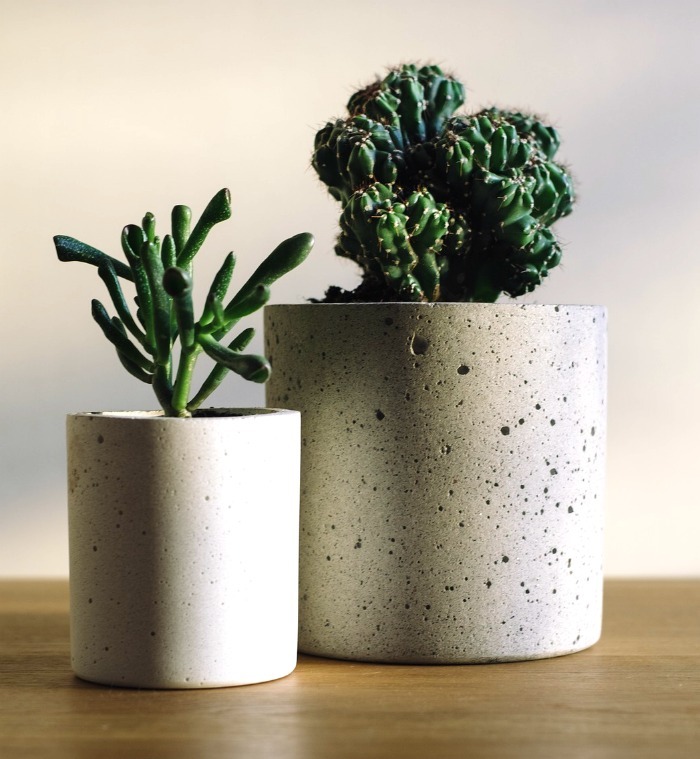 This senecio and cereus monstrose are perfectly balanced in these simple succulent planters. Since succulents and cacti are grown mainly for their leaves and have a compact shape, adding color in the form of planters is a fun idea. This bright red tin planter is the perfect home for the donkey’s ears (kalanchoe tomentosa)succulent and the small barrel cactus in the background also looks great in the brightly striped ceramic planter. Air plants are a special type of succulent that has a very limited root system. Displaying them is a lot of fun and many containers can be used. 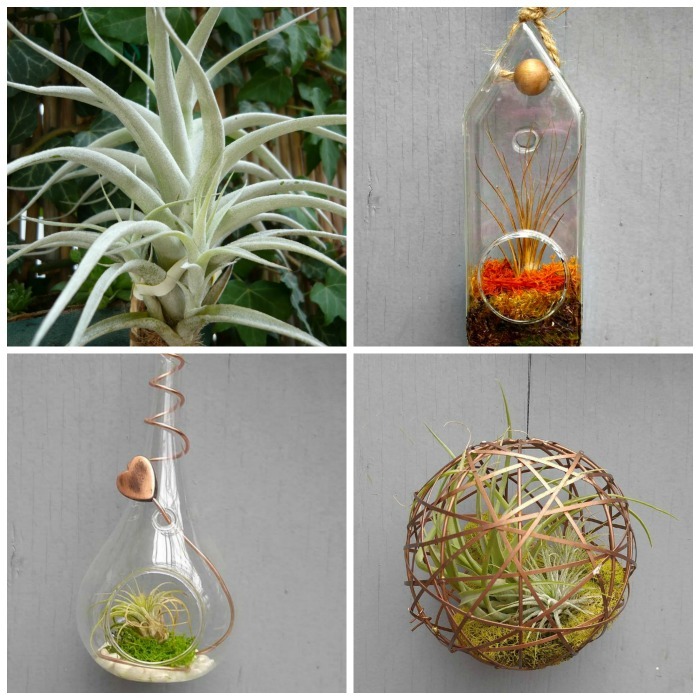 See some other ideas for air plant holders here. Household Items used as Succulent Planters. 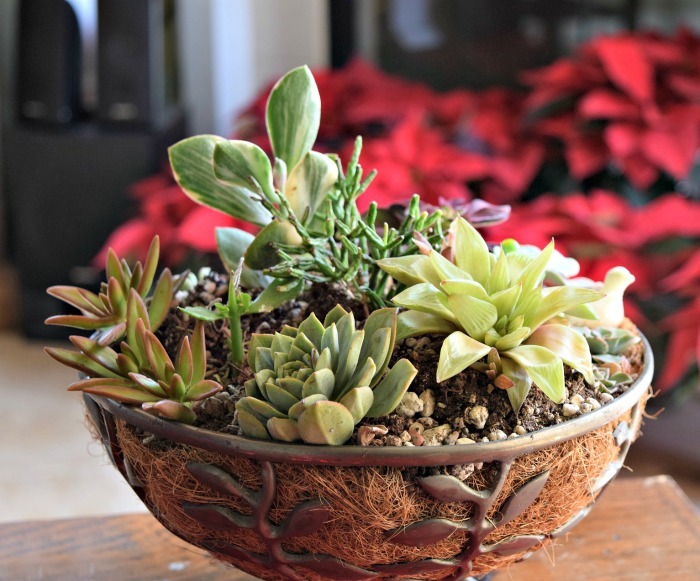 Look around the house and you’ll find all sorts of items to use to plant your succulents in. Will it hold dirt? √ Is it rustic looking when planted? √ Then plant it up! 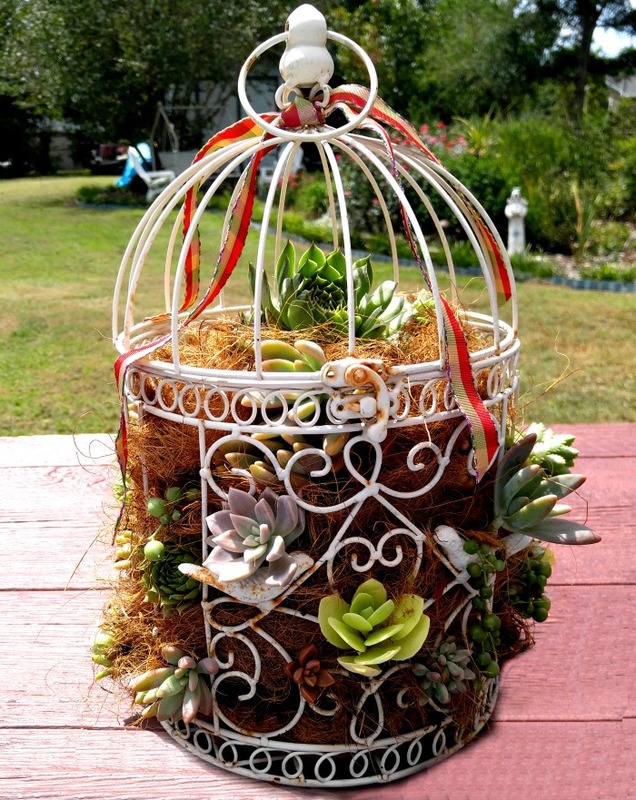 This bird cage is lined with sphagnum moss and then soil is gradually added as it is planted with succulents for a totally charming look. See how I made my bird cage succulent project here. Don’t throw that broken urn away. Just plant the broken area with hens and chicks and watch them start to fill out and cascade over the opening for a wonderful rustic look. This fish bowl is the perfect home for succulents. 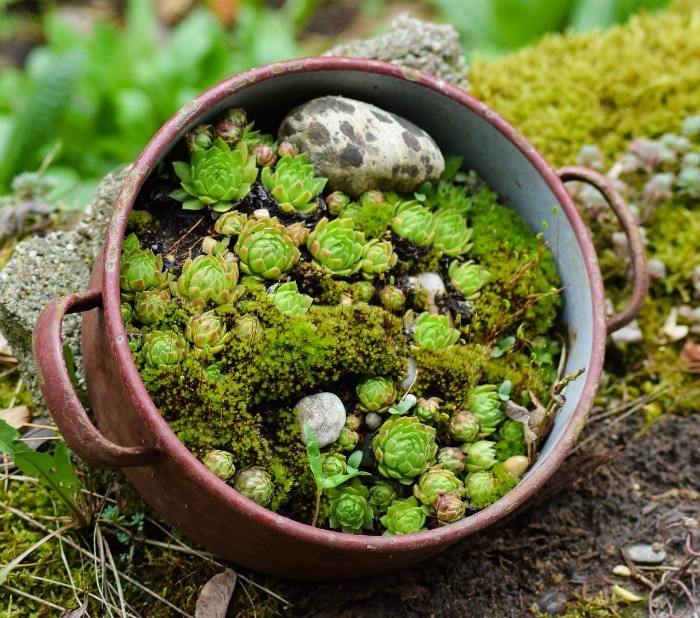 You will rarely need to water it, and the fleshy haworthia, crassula and echeveria all look right at home planted in this bowl that is positioned sideways to allow for the cascading nature of some of the plants. 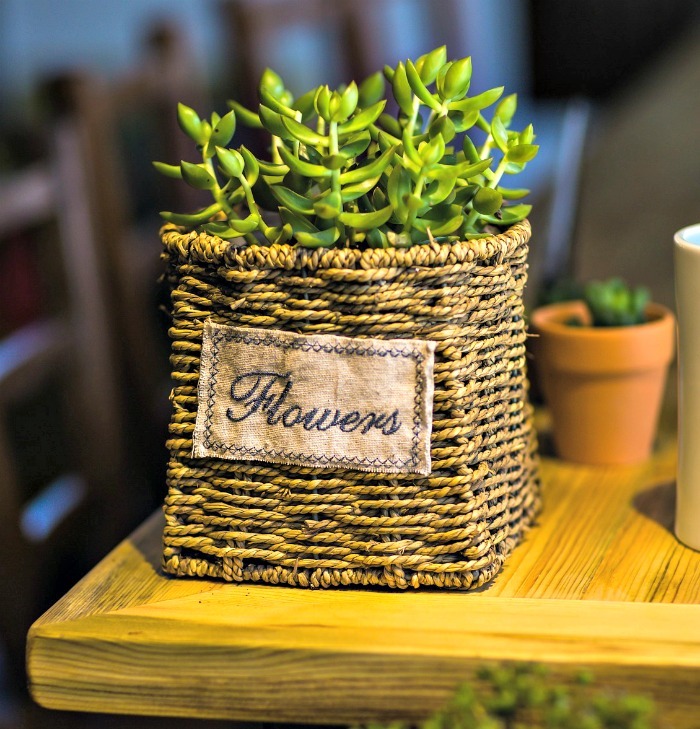 Embroider up a small patch with the word flowers and attach it to a rustic and sturdy small rope basket. Then add soil and plant with a few small crassula plants for a farm house look. This is my all time favorite succulent planter. 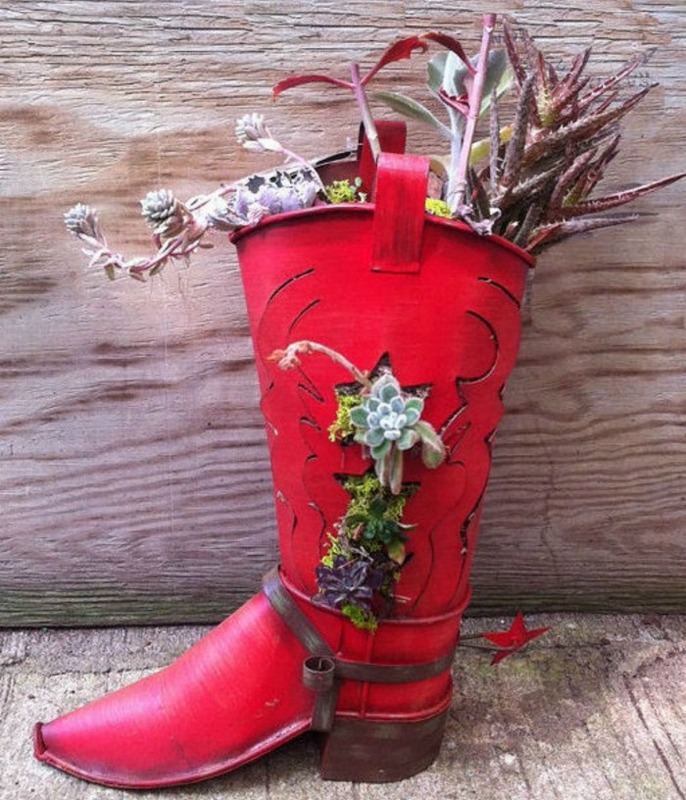 This metal cowboy boot has some star shaped cut outs on the side that are just perfect for small succulents. Then fill with soil and add some larger ones on the top. Southern Country chic at it’s best. If you have an old thick book that has a few ripped pages and a bad cover, don’t throw it out. Recycle it as a succulent planter. Just open the book to the middle and use a sharp exacto knife to hollow out a rectangular area on one side. 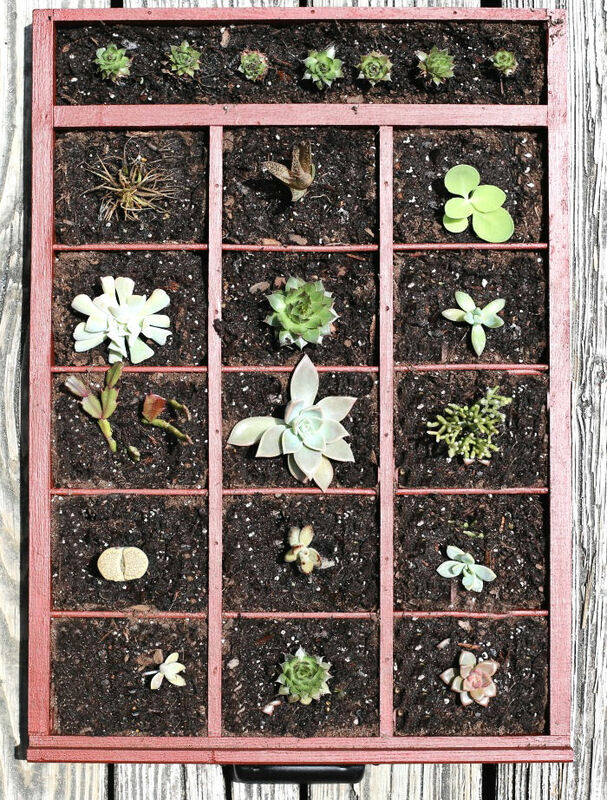 Fill the hole with potting soil and add a few sedum plants for a unique and charming look. Let’s head outside to see what we can use for a succulent planter. 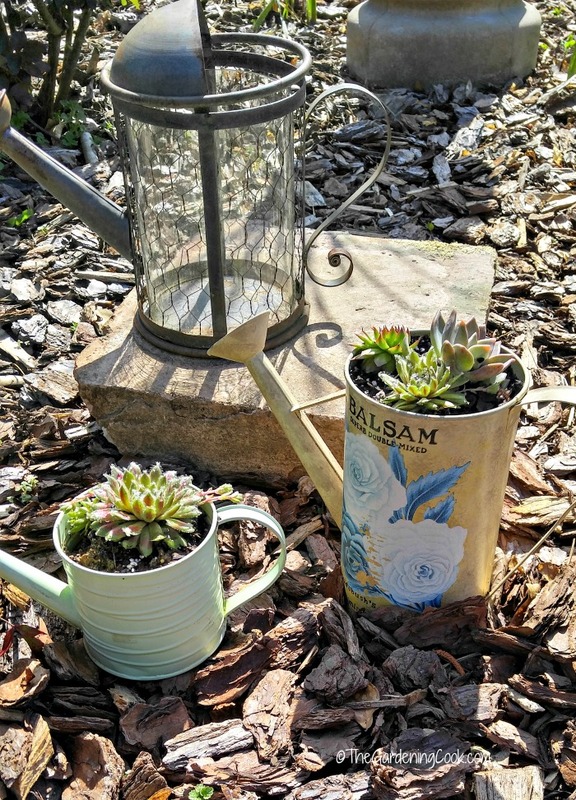 There are so many items found outdoors that can be used to plant your succulents in. They normally already have rustic look and lend themselves to this type of project. Here are a few fun ideas. I have a whole collection of watering cans that I use as planters. Some have a sentimental value like these three that my mother had in her garden, and others are items that I have picked up at consignment shops. I have them planted around my garden beds with various plants. This grouping shows echeveria and sempervivum potted up in a charming way. Watering cans are so versatile in the garden. They can be used as planters or just as decorative items. See more inspiration for watering can planters and garden art. When you cut down an old tree, you’ll be left with an unsightly stump. 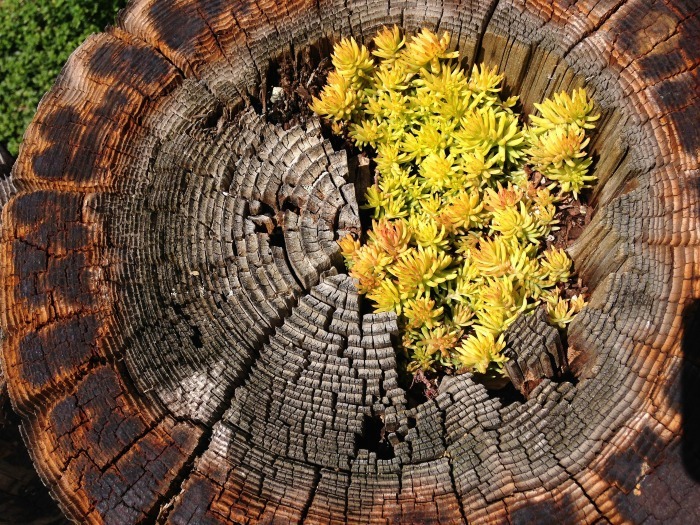 This photo shows it put to great use as a succulent planter for this yellow senecio. It will keep spreading and cascade out, eventually covering the stump beautifully. Any type of logs can be put to great use as planters. Old pieces of slate stones are arranged here sideways with an opening left for plants. 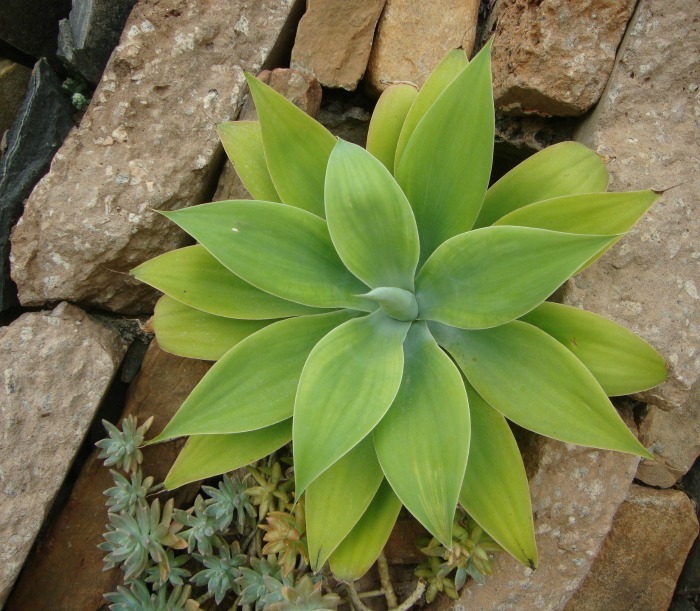 A big agave attenuata is the focus of the planter and the smaller pachpyturn will spread out in time. 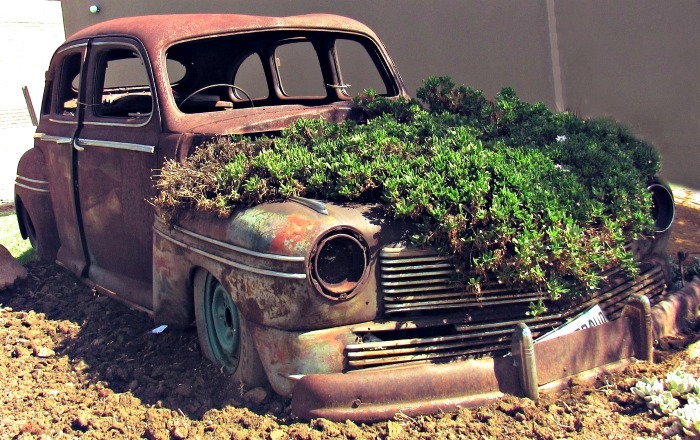 Even an old car can be turned into a succulent planter. The lid of the car has been removed and soil added around the engine area. The whole front of the car is covered in succulents. What would have been an eyesore is actually quite charming and rustic! I have used cement blocks in two different projects to house my succulent plant collection. 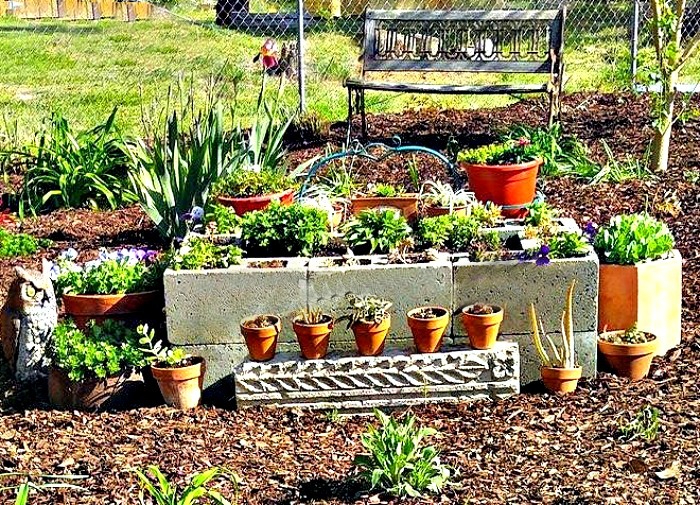 In this photo I used them to make a raised garden bed, and a few years ago, the same blocks were fashioned into a unique corner plant stand for my succulents. Got a brick? Make it into a planter! 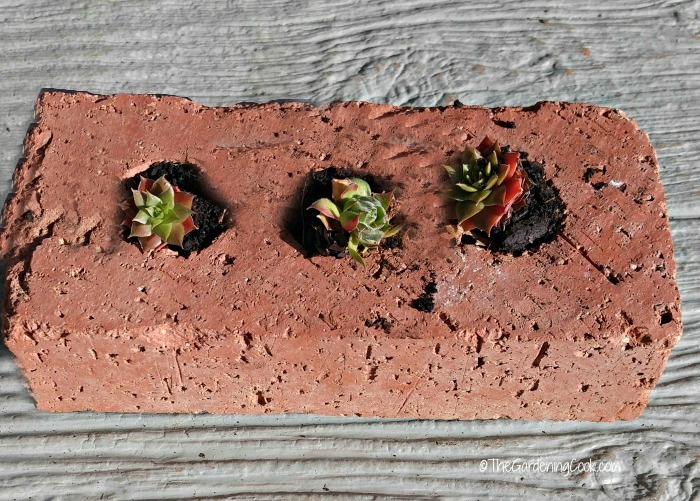 These tiny crassula and sempervivum are the perfect size for the small holes in this single brick. 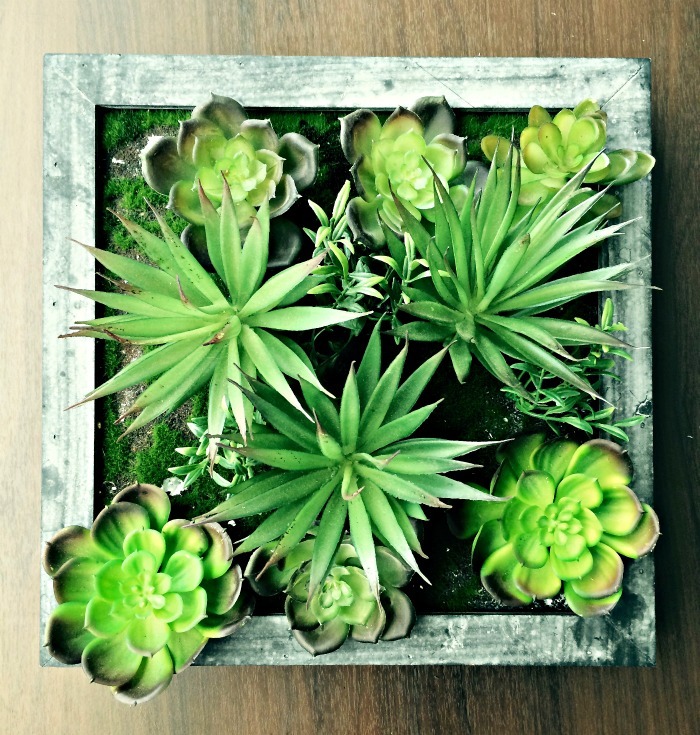 This simple wooden box has been transformed into a charming planter for echeveria and agave plants. I’ts simple, rustic and just screams farmhouse chic! Strawberry planters are perfect for succulents. Strawberry planters are large upright planters designed for the cascading nature of strawberry plants. Each time the mother plant sends off a baby, just plop it into one of the side pockets and it will root there. Any cascading plant such as spider plant and strawberry begonia will also work just fine too. But so will succulents! Check out these two ideas! This pretty blue strawberry planter has small individual succulents and cacti in the side areas and some larger plants for height and a cascading succulent on the top layer for a pretty look. See this strawberry succulent planter tutorial here. And finally, the mother of all strawberry planters! I discovered this on a trip to Biltmore near one of their small cafes that had loads of succulents in planters. Ferns, cascading plants and succulents were planted for a dramatic focal planter that was about 5 feet tall! 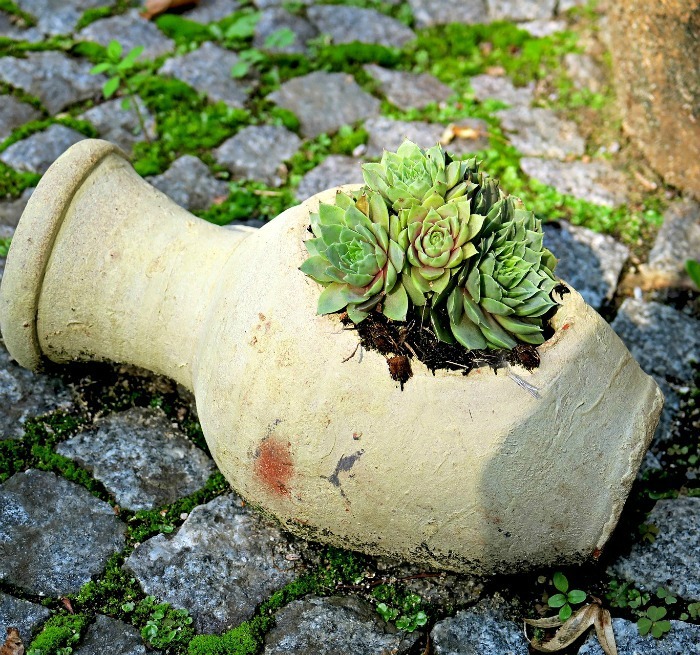 What have you re-purposed to use for planting succulents at your house? Please share! I’d love to see your creations in the comments below. Great ideas. I’m trying to find the right tool to cut holes inside candle holders I bought at the dollar store but the drill bit I have is getting beat up. Any suggestions? depends on what the candle holder is made of, but we’ve had good luck with a ceramic bit for pottery or glass.